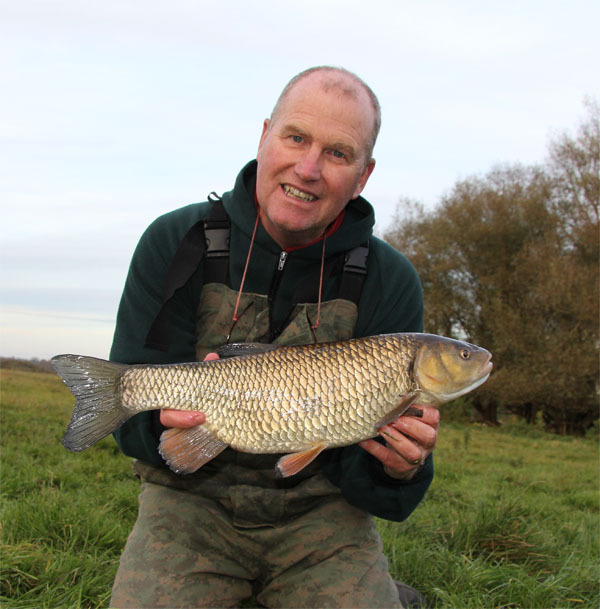 On the Saturday after my great chub result on the Friday of two 6lb plus chub I was the guest speaker at the Tench Fishers AGM at Milton Keynes. I gave a short talk about my last year of angling. I did mess up a few of the dates which caused a few laughs. Well the years really pass by so fast on one slide it was December 2106!!!!! A week after the two chub of 6lbs I was driving down to the river again. It takes anywhere between 1hr 40 mins to 2hrs to drive down there from home. The road traffic can be slow with little chance of overtaking. The day was dry and relative bright. Arriving on the banks I normally look around to find some fish, however being early there was little chance of me seeing much. A slight frost tinted the grass so it was cold. I still walked a couple of stretches but nothing seemed to convince me to be worth fishing. I bumped into John and Terry who were both chub fishing. We said our hello’s and goodbye’s as we pondered which swims to fish. I returned to a swim which has been kind to me in the past and I could just make out some fish swimming around near to the willow branches which normally holds plenty of fish. I put in some hemp and maggots with a dropper and left it for about 20 mins as I went for a walk to look at some other swims. One swim had a few chub present but another banker swim had nothing present which was a huge surprise. Returning to the baited swim I saw a few chub on the food. The bright conditions didn’t help seeing into the river as the sun reflection was quite dazzling. So the maggot feeder rig was put together. 6lb main line and 4.12lbs hooklink and a size 20 hook. So the first cast saw a couple of plucks on the rod top however nothing much happened for two hrs other than these taps which were from chub picking up the maggots in their lips. Feeling some resistance and letting go. I could see occasionally shadows near the feeder then a tap and that was it. The really good news was that the minnows were none existent. The chub were there in numbers as I pulted in some maggots and the chub came up in the water to chase the maggots downstream. 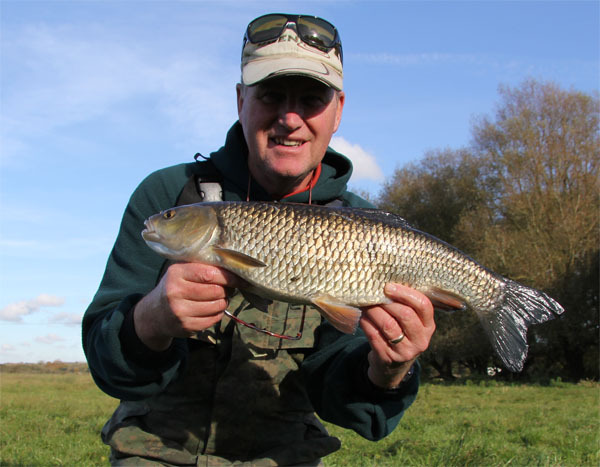 All day long the chub rolled in the swim so I felt that later in the day I would catch a few. At 1.30pm the first real bite had me playing a chub. I very quickly had it away from the willow branches snag. In the river it didn’t look very big and sure enough on the scales it went 3lbs 14oz. Some cloud started to come in from the west and it was due to rain during the evening. Funnily enough the suns disappearance helped with the visibility. 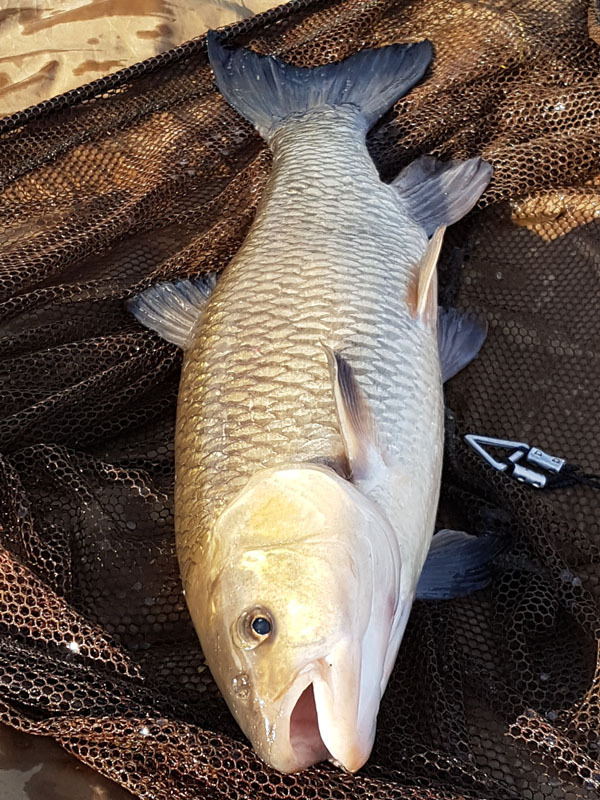 There were plenty of chub in the swim. The next chub bite again had the rod hooped over and away from the willow branches it came. Once they are in midstream it’s just a case of playing them carefully to the net. Normally this requires a walk downstream of about 30 yds or so. This chub looked a little larger and sure enough it was just over 5lbs. They look so beautiful in their autumnal colours. Scale perfect too. The next bite came shortly after returning the chub this time the tiny size 20 hook straightened which was a first for me in a long time. It could have possibly been a barbel. The next couple of hours passed by with me landing another 4 chub with plenty of taps and plucks on the rod top. The largest of these was just over 5lbs again. The cloud started to thicken however it was still quite cold with the wind speed increasing. I had a friend for company for the last few hours. I think it was hungry. It was male mallard who kept looking for escaped maggots. It was so friendly that on a couple of occasions on playing chub I almost stood on the thing. Take a look at this video to see how friendly it became. Andy had the same problem with ducks the previous week and then there was 3 of them. I wonder where the other two are? So 6 chub was not a bad day however nothing big showed up. The chub I think are wising up in this swim. 2x5lbers 3x4lbers and 3lbs 14oz was about it. Still I had been a bit of a roll of late. This entry was posted on Wednesday, November 16th, 2016 at 6:41 pm	and is filed under Uncategorized. You can follow any responses to this entry through the RSS 2.0 feed. Both comments and pings are currently closed.